Back in 1981, Namco released a game called Galaga that would change the gaming world. The idea was simple, control a vertical-scrolling spaceship and defeat wave after wave of insect-looking enemies. Now twenty-seven years later, Namco has released a sequel named Galaga Legions. 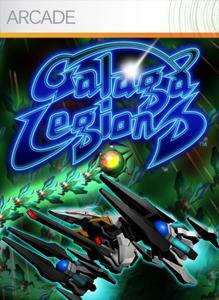 Legions is not only a graphically enhanced version of Galaga, but a game that also features numerous new game mechanics. The most notable change from Galaga to Galaga Legions is the updated graphics. Instead of a simple array of colors, we’re now thrown into a game that can not only induce an epileptic seizure, but can also bring older gamers back to their PCP days. Not that these are a bad thing per se, but it’s something you have to be ready for. Another big upgrade is the addition of two “satellites.” Veteran gamers will recall in the original Galaga, you were a single ship that could only shoot in one direction, up. Now, you’re given the ability to not only shoot up, but to also place up to two satellites anywhere on the screen. These satellites are very useful as they can shoot in any cardinal direction, and will bail you out of numerous battles more impossible to escape from than Alcatraz. These satellites were however, not just thrown in for extra ammunition, but because the enemy AI has been completely revamped. No longer do enemies come in short waves, but rather in a plethora of waves. At times it seems the entire Persian army from Frank Miller’s 300 is at your doorstep, each equipped with the tracking senses that only a hound could rival. There’s also a new addition of game types, we’re now introduced to an adventure mode, as well as a championship mode. In adventure, your goal is to make it through all five areas, each with five levels. The hard part? You have to go through all twenty-five levels in one play through! There’s no saving, no checkpoints, just you and your satellites gunning for control of the universe. In championship mode you simply play one of the five areas and try to score the highest amount of points in that area. Championship is not nearly as much fun as the adventure mode because there just isn’t as much action to test your skill. All in all, Legions is a fantastic upgrade to the Galaga franchise. It’s quiet a bit harder than the original, and the graphics and additional firepower take some getting used to, but the addicting game play will keep you coming back for hours upon hours of intense insect shooting fun.